If you couldn’t tell from my last post- I‘m on a blue cheese kick! 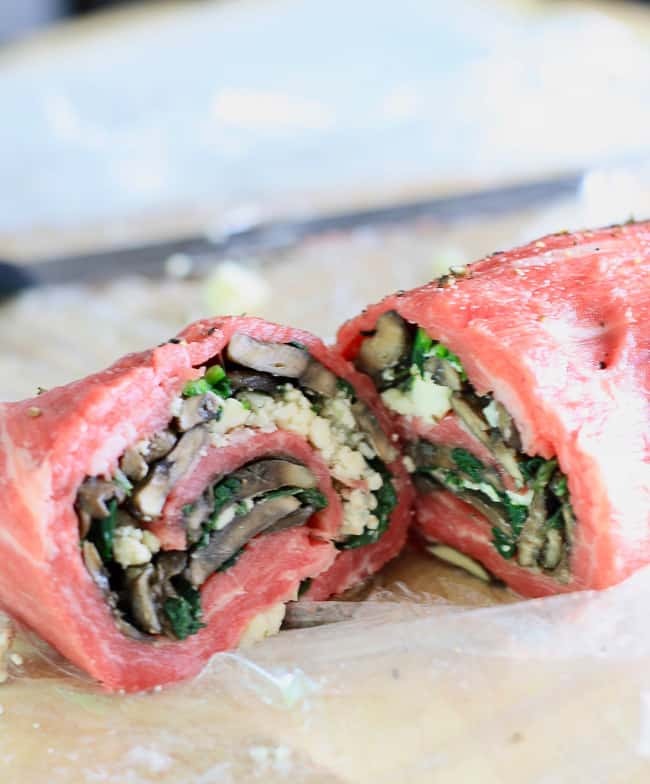 This Stuffed Flank Steak is chock full of blue cheese, spinach, and mushrooms- and it’s easy and delicious. A perfect Father’s Day dinner, or a special treat for your new graduate! I made this one up on my own, and it will go in my regular rotation- my husband LOVED it! Delicious Stuffed Flank Steak Ready to Sear! Now- won’t bore you with how difficult it is to photograph steak- It’s hard! I was rather happy with this photo though- it shows the deliciousness of all of the ingredients. I topped mine with some basil and balsamic glaze. I use Nonna Pia’s– I bought it in Whistler at a Farmer’s Market a long time ago and now they’re big time- in Costco, and a few other Kroger stores I believe. It was nice to find it though- it’s delicious stuff! If you don’t want to purchase yours, you can make it easily by simmering 2 cups of balsamic vinegar on medium heat until syrupy. It’s that easy! Top with some basil, and balsamic reduction for a flavor kick- boom! hiya! I precooked the mushrooms with some butter and garlic, then added in the spinach for a few minutes and set aside. Pre-cooking the mushrooms and spinach. Use good butter, and a bit of garlic for taste. Then- I pounded out my flank steak. I’m embarrassed to admit I don’t have a meat hammer- A meat hammer, really? I have every other kitchen gadget known to man except for a meat tenderizer. So… I used my husband’s rubber mallet with some Saran Wrap and it worked like a champ! Pound it out so it expands to 1 large flat piece. If your steak is too thick, butterfly it down the center and then pound it. Keep in mind if you do this, you may be low on the filling so just see where you’re at. 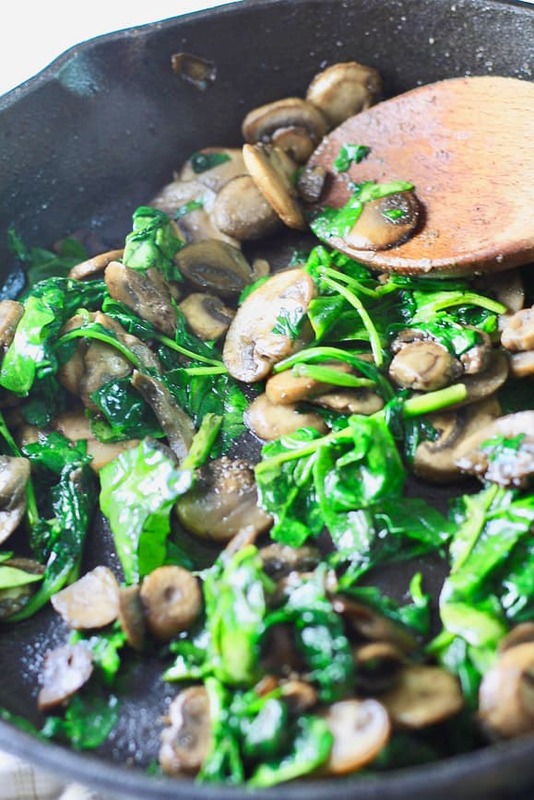 You might need to add more mushrooms and spinach. 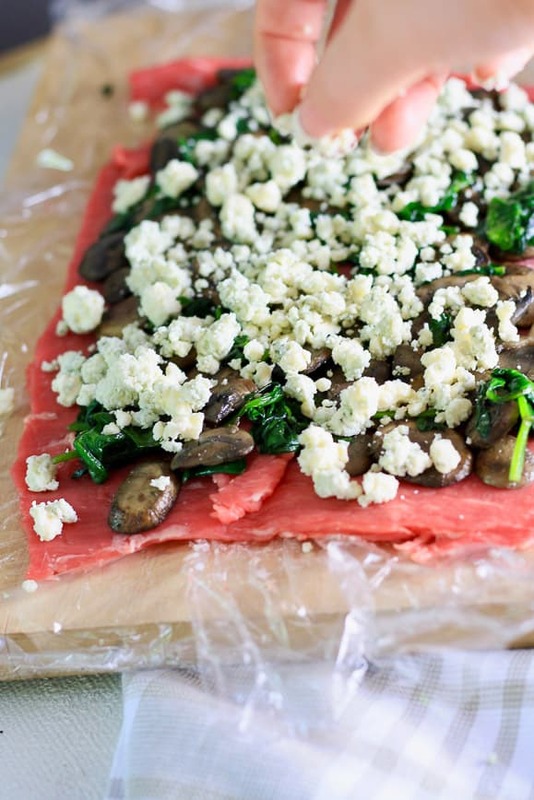 After tenderizing your steak- top with your spinach, mushroom and blue cheese. 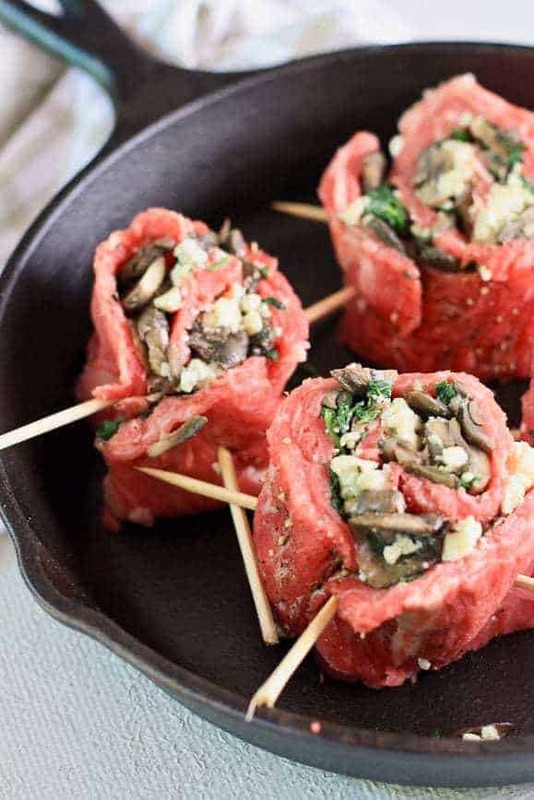 After you pound, and top your flank steak with its stuffed goodies, you’re going to roll it. This is not hard, but does require some persistence. Go slow, and use the Saran Wrap to ‘pinch’ the roll to keep it tight. Rolling, rolling, rolling! Keep that flank steak rolling! Once you roll your steak, it’s time to slice it into rounds so you can sear it. I recommend using a large, Sharpe knife. You want to job your hand a little bit, but for the most part, it should slice it cleanly. Slice it, sear it, eat it! Sear it for about 8 minutes- and you’re good to go! Dinner time! 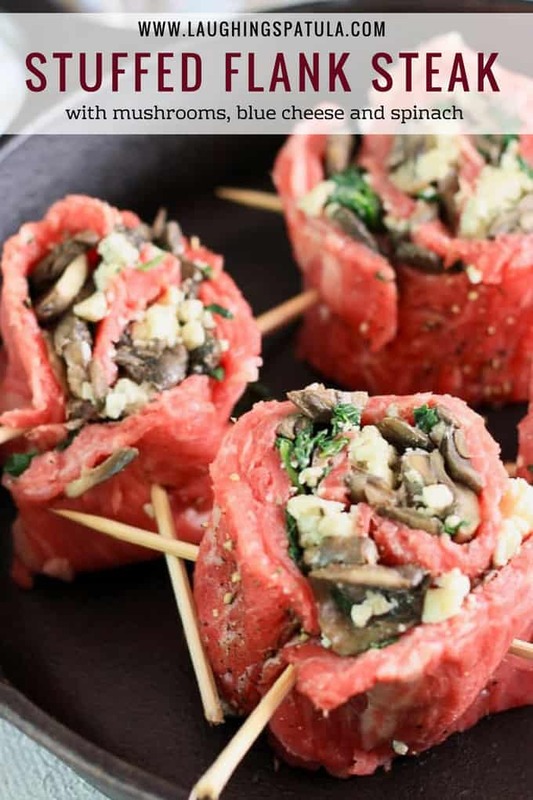 I love this stuffed flank steak with our twice baked potato bites– they are easy and delicious. I also love anything with carbs and garlic paired with steak! Our cheesy stuffed garlic bread is a winner for the whole family. Delish! 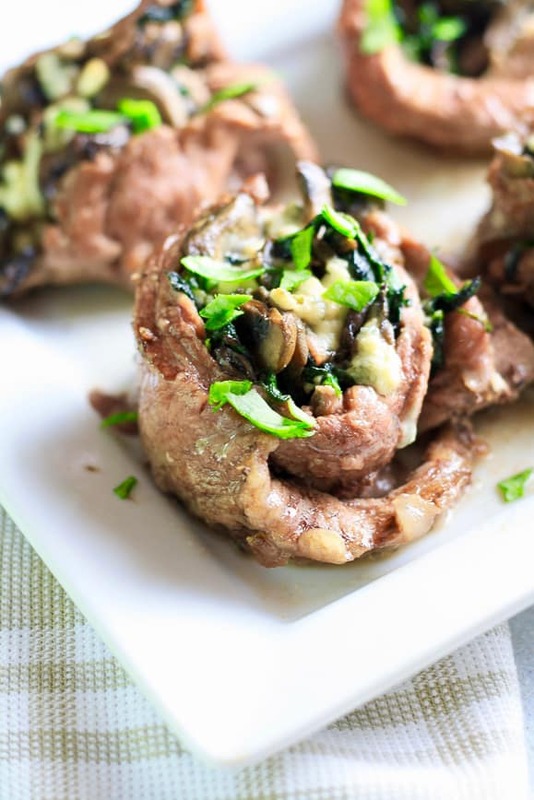 A delicious stuffed flank steak filled with mushrooms, spinach and blue cheese. Line a cutting board with Saran Wrap. 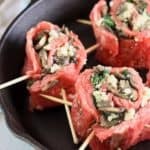 Lay flank steak over Saran Wrap, and cover top of flank steak with Saran Wrap. Pound flat and tenderize, so the steak expands in area, about an inch. Sprinkle both sides with salt and pepper. In a shallow pan, heat 1 tbsp olive oil on medium heat, and add mushrooms with garlic powder, and a pinch of salt and pepper. Cook and stir continuously for 5 minutes. Add spinach, and cook for 3 more minutes. Remove from heat and let cool for 10 minutes. Wipe pan clean and set aside. Remove top layer of Saran Wrap. Top pounded steak with mushroom and spinach mixture, spreading to 1 even layer over entirety of steak, and top entirety with crumbled blue cheese. 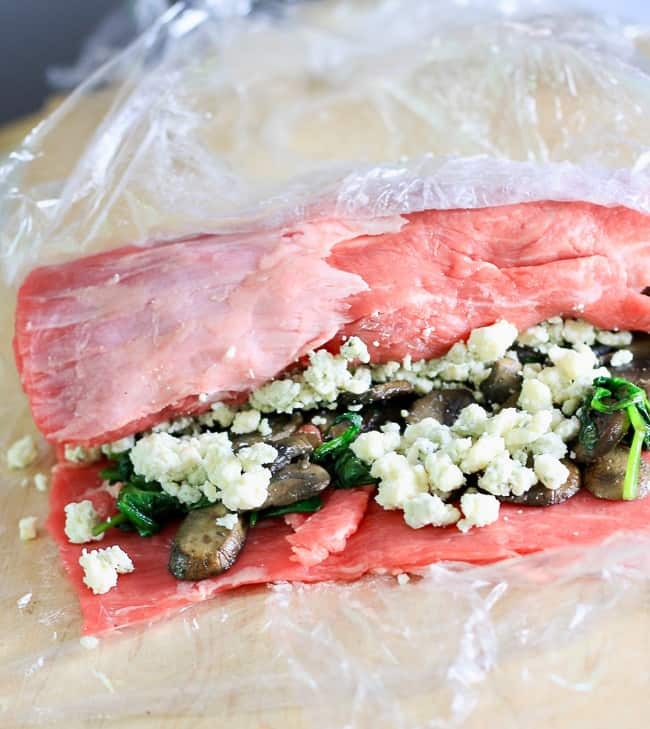 Begin to roll your steak, using the lower Saran Wrap to 'pinch' the roll for tightness. Go slow and pinch tight! 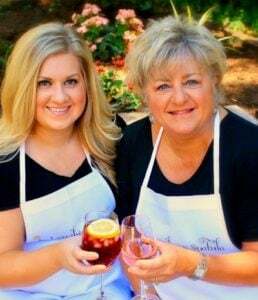 Slice into 1 1/2 to 2 inch sections using sharp kitchen knife. Pierce through 2 skewers diagonally to hold sliced roll in place (see picture in post for example). Tip- If your skewers are too long, cut them in half! Garnish if desired- Reduced balsamic and basil optional. Enjoy!